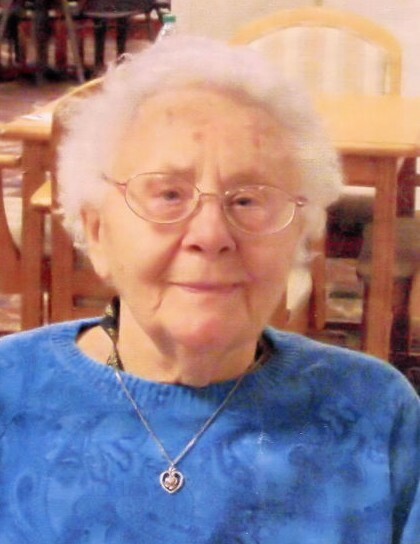 Marie J. Kusek, 98 of Omaha, NE formerly of Loup City, NE died Sunday, April 7, 2019 at Maple Crest Care Center in Omaha, NE. Mass of Christian Burial will be 10:30 a.m. Saturday, May 4, 2019 at St. Josaphat’s Catholic Church in Loup City, NE. Father Richard Piontkowski will celebrate the mass. A Sodality Rosary will be held at 10 a.m. Saturday at the church. Inurnment will follow at the Evergreen Cemetery in Loup City. Visitation will be from 9:30 a.m. to 10:30 a.m. Saturday at the church. Memorials are suggested to the Kusek family or donor’s choice. Marie Josephine (Schroll) Kusek was born September 20, 1920 to Ignes and Anna (Seifert) Schroll on a farm north of Ravenna, NE. She attended school through the eighth grade at Dry Creek, District #20. Marie graduated from the Ravenna High School in 1937. After high school, Marie taught in several schools in Sherman County. On May 31, 1949 she was united in marriage to Louis Kusek of Arcadia, NE at St. Mary’s Catholic Church in Ravenna. They lived on farms near Arcadia, west of Loup City and near Ravenna. In 1984, Louis and Marie retired from the farm and moved to Loup City. In March of 2009 they sold their home and moved to Westside Park in Loup City. Marie was a member of St. Josaphat’s Catholic Church in Loup City, Rosary Sodality and St. Anne’s quilting group. Louis passed away on April 24, 2011. They had been married for 61 years. She is survived by her sons, Donald of Omaha, NE; Joseph and wife, Kathy of Overland Park, KS; three grandsons, Christopher and wife Chelsey (Kansas City, MO), Corey (Lawrence, KS), and Kevin and wife Bethany (Lincoln, NE); great grandsons Miles and Kai; Sisters-in-law: Rosanda Schroll of Ravenna, NE and Mary Kusek of Omaha, NE and many loving nieces and nephews. She was preceded in death by her parents; husband, Louis; infant son, Leonard; brothers, David and Ferdinand and sister, Marguerite Hurt. There's still time to send flowers to the Visitation at the St. Josaphat's Catholic Church from 9:30 AM to 10:30 AM on May 4, 2019.